Of the different peoples throughout the world, the Native American Indians are known for their unique feathered headdress. In fact, the feathered war bonnet is only commonly attributed to the Native Americans. But did you know that not all Native American tribes wore the same kind of headdress? I have even seen a picture of a Native American wearing a wooden headdress. Two of the most popular Indian headdress are the roach type headdress and the war bonnet. If you have a chance to attend Powwows, you'd be able to see Native Americans wearing either of these. Before the arrival of the white people on American soil, the Indian tribes could be identified by their headgear. The Omaha Indian warrior wore a roach headdress which are made of deer's tail dyed in color red to depict the honors won by this warrior. This type of headdress was also used by both eastern Indian tribes and plains Indians. Many braves wore a single feather to signify bravery. The feather may be worn at the back of the head standing upright or placed at the side of the face. However, unlike the Plains tribes, most eastern tribes didn't wear feather. The Cheyenne Indian wore buffalo horn bonnet during some ceremonies. On the other hand, the best known Indian headdress is the spreading eagle feathered headdress of the Sioux. This headdress is made of feathers, horse hair, cloth, animal horns, or pelts. During the early times, only the Plains Indians wore this headdress. Later, this can also be seen in pictures from Seminoles to the Apache. Among the Plains Indians, the eagle feather headdress (also known as war bonnet) represents an accumulation of deeds of bravery and services to the tribe. Although originally worn on special occassions, the war bonnet was thought to have medicine or sacred power which can protect the wearer in battle. 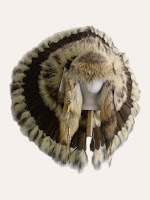 This war bonnet are commonly worn by the chief of the tribe. Today, each Indian headdress has become a work of art which bear the pride of the Native American culture. You can see different colorful Indian headdresses worn by Native Americans during special cultural gatherings including Powwows where Native Americans participate in their cultural dance contests. Today, you too can purchase any affordable Native American Indian collectibles at http://www.nativeamericanindians.net/.